Home brushes give-away Friday Sigma Makeup Brushes Giveaway! Happy Friday! Like last Friday, it's the end of the week and time to celebrate with a giveaway! Today I will be giving away Sigma Makeup Face Kit and Eye Kit, yay! There will be one winner on my blog, and another on my YouTube page. 1) To win on this blog, make sure you're a follower. Hit the follower button, that's it! Also, leave a comment saying hello! 2) To win on my YouTube page, make sure you're a subscriber to my channel and leave a comment on the Video saying hello! Check this blog on Monday, August 31, 2009 for the winners. Winners will need to email me their contact information at makeupbyren@yahoo.com by the Friday after (September 4, 2009) in order to not forfeit their prize for another giveaway. OMG! I'd definitely love to have one of these! I can't believe it's Friday! The week passed by so fast. I'd love to enter this. Happy Friday, Ren! How's the eye? Hi Ren! Have a Happy Friday! Hello Ren! Please include me!! hi ren! count me in for ur giveaway! Hola Ren! tgiFriday! These would be aweeeeesome to win! I want to enter, I'm not sure if I'm a follower officialy since I found you , but I cant see the button to check! Hi Ren! How are you? Heeeey Ren! Happy Friday chica! Good morning Ren! Pick me, pick me! Hello ! Hi Ren ! 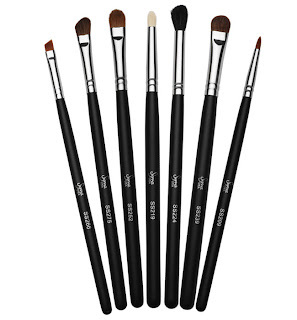 I join this group i only have 2 or 3 brushes "Sniifff"
Ren, winning these brushes would make my summer!!! Hi Ren! Please enter me into the brush draw. Thank you and enjoy your weekend! I love giveaways!!!! pick meeee....lol have a wonderful weekend. Hi Ren, I would love to win those brushes!! Please include me in this giveway! Hello Ren!! Those brushes look great!! Enter me please!! Yay for Fridays!! Hi, Ren Ren - thanks for doing another giveaway! hello! cool give away hope i win! Now this is what I call TGIF!!! Hello - I would love a chance for the Sigma Brushes. THANKS!!! HELLO :) plz enter me thanks a lot! Hello Ren, TGIF !!! :) Have a good one. Hello Ren :) Glad the weekend has arrived! I'd love to try those brushes. Count me in for the contest! Hey Ren! This is such a great giveaway! It's another Friday. Really looking forward for your giveaway! hi ren!! totally cant wait to hear the winner! TGIF huh!! anyway enter me to your constest!! Hey RenRen. I think you are great for wanting to share you skills and products with the world. TGIF! Have a wonderful weekend. Hi Ren! I'd love to receive one of those sets! Have a nice weekend! i love your friday contests!!yay!! Hey Ren. I'm loving these Friday giveaways. They make ending the week so wonderful. Hey RenRen I just signed up to blog spot just for you and your give away.. I cant wait to read your blog and get great tips and ideas..
Hi Ren! I'm so glad it's friday and glad your giving away another sigma set! yay! thnx and good luck everyone! Heya Ren... have a fab weekend! A big fat H E L L O to renren! thanks for hosting another giveaway - supergenerous of ya! :) obviously i would be absolutely thrilled to win one so please count me in! I live in Brazil, but I participate? Hello! Thanks for having this giveaway! Hi Ren have a great friday & weekrnd!!! Hello Ren! Happy Friday Girl! Thanks for the bril giveaways ! ooohh another one.you and sigma are very generous and nice anyway..HELLO!! hey ren!! I would love to win!! i would love to win so count me in! Hey Ren!!! I love friday's more now! LOL! Hi Ren! I'd love to win a set of Sigma Brushes! Love your blog! Hey Ren! Another reason for us to LOVE fridays! you go girl! sounds awesome, i'd love to be entered. Hello!! I follow you thru RSS feed. Does that still count?? Hello Ren.. Thanks glad its friday!!!!!!!! Thanks for the chance to win and good luck everyone!!! Thanks for setting up this contest renren :) Happy Friday! Hey Ren! Loving these giveaways! I really need brushes so I hope I win :D But still, good luck to everyone! Hey Ren. I'd love to win some brushes. Please enter me. Hope you have a great Friday and a lovely weekend. Hey Ren! Happy Friday!.. Much Love, ZunnBugg "zvillamil"
hey ren! i'd love to enter! and by the way, i didnt know you were from atlanta! i just moved to warner robins not even a month ago. could you tell me where some nice shopping places are around atl? i'd LOVE to go once i find a job, lol! Hello!!!! Happy Friday and enjoy your weekend!!!! Hello REN REN I hope I win!!! Hello!! i ♥ your giveaways! I want to Say hello...and WINNNNNNNN! one of my top wishlist..
Hi Ren, love this blog and your YT channel. I could not find the follow button, but I do have you on my blog list. Thanks for having this contest. Hey Ren! Happy Friday, mines is nearly over. Hittin your blog from the real white north, LOL Norway. Have a great weekend!! Thank god it's friday and thank you gorgeous for this contest! Hello, I'd love to have these brushes. Yay for Friday! Hi Ren! I'd love to win! Hello RenRen! Have a good weekend! Hello!! I'd love to win! I'd definitely love to win! I've been working with 4 brushes only! 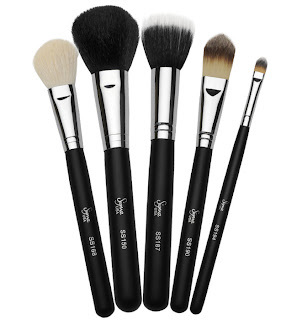 Sigma Makeup Brushes Travel Set Winner!